HomeBatteryEnvironmentGadgetsGreen ProductsRecyclingBattery Reverse Vending Machine That Can Recycle All Types of Household Batteries! Battery Reverse Vending Machine That Can Recycle All Types of Household Batteries! Tons of replaceable household batteries are used every year and while battery recycling is mandatory in every country to reduce the environmental and health risks. Now, Refind Technologies brings the world's first battery reverse vending machine which is targeted for battery collection points such as retail stores and battery manufacturers. Battery recycling machine gives grocery store coupons in exchange for your old batteries. The machine accepts all types of household batteries. The machine accepts the sizes: AA, AAA, C, D, and 9V. It identifies the size of the battery, counts them and returns a receipt that can include for example a discount coupon or any other kind of refund in written format. The system is a complete identification and returns point for all cylindrical and 9V batteries with a total capacity of 50kgs (100lbs). The logic behind the refund is programmable and possible to change if needed. A customer places their spent batteries in the machine's depository and then the machine gives the customer store discounts based on how many batteries they returned. Currently, the machine offers 1 krone ($ 0.12) for every returned battery. This is a wonderful development and we hope this machine would be available at many places soon. 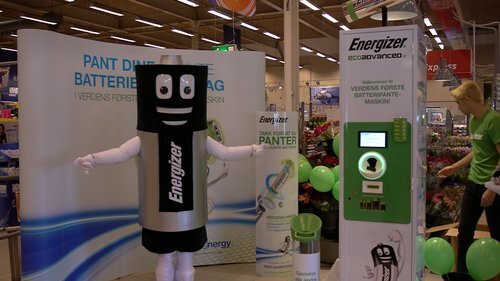 Also, one of Norway's largest supermarket chains, Coop Norway installed three machines for used battery recycling. Let us stop throwing them to trash that finally goes to landfills! !